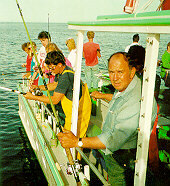 The Bunny Clark is a forty foot fiberglass deep sea fishing boat built in 1983 and specially designed to carry passengers with speed, comfort and stability. She is powered by a Roger Penske 8V-92TA diesel (New in 1993) which delivers 650 horsepower and is insulated to reduce noise. A spacious bathroom is located forward for your convenience. The deck area is equipped with rod holders and seating for everyone with ample space for your coolers and belongings. A large canopy covers most of the deck to protect from rain or spray. 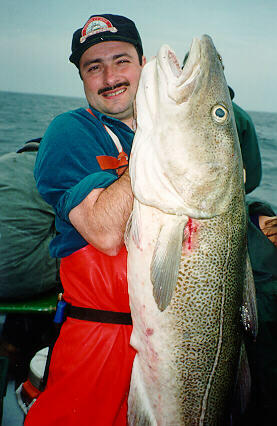 Trophy sized fish, like the 52 pound cod Fred Kunz caught on June 3, 1995 (pictured above), are some of the fish we like to target. The Bunny Clark has modern navigational and lifesaving equipment. She is equipped with two 36 mile radars, an automatic Loran C position indicator, Global Positioning System (GPS) position indicator, color fish finder, paper recording fish finder, cellular phone (emergencies only) and various radios. Lifesaving equipment includes lifepreservers, life rafts, search and rescue lights and much more. The Bunny Clark exceeds the rigid U.S. Coast Guard safety standards and is inspected and certified for offshore work to 100 miles. The fishing is mostly bottom fishing for cod, pollock, halibut, haddock, hake, cusk and wolffish. Anglers may use bait or jigs. The bait is Maine shrimp, surf clams or mackerel. We usually drift fish. However, we will anchor when anchoring is more productive. When you catch your fish the crew will be there to gaff and land it for you. During the fishing trip, the mate will prepare or fillet your fish if you desire. We provide small plastic freezer bags with the fillets at no extra charge. Gratuities are accepted. We don't have rental rods. What other deep sea fishing companies call "rental rods", we offer for use as a service with the price of your ticket. These "boat rods" were all custom designed by me, Tim Tower, and were built through Saco Bay Tackle Co. (a favorite link of mine with great photos!) in Saco, Maine. They are a fiberglas/graphite mix with extended foregrips (comfort) and probably the best rod for either bait fishing or jigging. These rods are fitted with Penn 113H reels loaded with Stren line in 50 and 40 pound test. I believe that this combination offers the angler the most comfortable and forgiving fishing system that can be found anywhere for all people of any range of fishing ability. We offer custom made jigging sticks in either graphite or fiberglas construction. These rods have been designed for the expert angler by me, Tim Tower, and are the result of years of testing with many prototypes in various fishing conditions. They are fitted with Newell reels for the ultimate in casting ability, line retrieve and comfort in reeling. The Newell reels are sent back to the Carl Newell Fishing Tackle Co. in Glendale, CA to be repaired and updated on an annual basis. These reels are loaded with Cortland Micron line or Cortland Spectron (for less stretch and more sensitivity) with a monofilament leader adjusted in length to conform to the individual angler's demands. Our terminal gear is mostly custom made as well. Our jigs are made by Danny Angerman and Fred Burket and have been used to catch many trophy fish as well as world and state records. We sell custom made cod flies, rubber baits (Mojos) and bait rigs aboard. Guests fishing on the Bunny Clark are not required to bring any fishing equipment as rods and reels, bait, various jigs and teasers are all provided at no extra charge. However, guests are responsible for lost gear. Persons may sit and fish with bait or stand and jig. All that is needed to enjoy a day of fishing is a warm sweater and lunch. Beer is permitted (6 bottles/person max.) but bottles can't be opened until the boat is offshore. Intoxication will not be tolerated and hard liquor is prohibited. To insure a day of fishing, a reservation should be made by calling (207)646-2214. Guests should arrive one hour before departure. Payment in full required for a reservation. The Bunny Clark departs from Barnacle Billy's dock in the morning and departs from the Town dock (about 75 yards due east) for the afternoon half day trip. Before or after a fishing trip, anglers have the unique opportunity of dining on sumptuous sea food & lobster in a casual atmosphere at Barnacle Billy's or Barnacle Billy's etc. 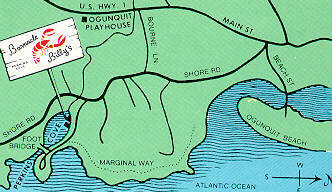 restaurants, enjoying the scenic coast via the (mile long) marginal way walk or having a refreshing swim from Ogunquit's beautiful white sand beachs. Trophy fish are recognized and awards are received by the lucky angler from the state through the Maine Department of Marine Resources. Every angler is provided with IGFA class equipment in case he or she lands a world record. Thirty world record fish have been landed by fishing guests since 1984. We have one world record pending as of January 16, 1996. See World Records below. We offer a tag and release program for those who are not interested in taking the fillets home or for those who are interested in fish migration. As conservationists, we endorse a policy of returning unwanted species (dogfish, etc.) to the ocean unharmed. Photographs of special fish will be taken and sent to you at no charge if you have forgotten your camera. We offer an optional "pool" for the largest fish landed during a trip. Skates and dogfish are excluded from the competition. Bunny Clark T-shirts, caps and hooded sweat shirts are available on request. We ask that you call our attention to anything you don't understand so that we can help you have an enjoyable and happy fishing trip. Click the icon to view a complimentary copy of the1996 Guestletter. Barnacle Billy's and Barnacle Billy's etc. This WWW Page developed by Matt Roche and Chamber Works, INC exclusively for Bunny Clark, Corp. Copyright 1995. All rights reserved.